An ordinary life-its sharp pains and unexpected joys, its bursts of clarity and moments of confusion-lived by an ordinary, but unforgettable woman: this is the subject of Someone, Alice McDermott's extraordinary New York Times bestselling novel. We first glimpse Marie Commeford as a child: a girl in thick glasses observing her pre-Depression world from a Brooklyn stoop. Through her first heartbreak and eventual marriage; her delicate brother's brief stint as a Catholic priest and his emotional breakdown; her career as a funeral director's "consoling angel"; the deaths of her parents and the births of her children-we follow Marie through the changing world of the twentieth century and her Irish-American enclave. Rendered with remarkable empathy and insight, Someone is a novel that speaks of life as it is daily lived, with passion and heartbreak, a crowning achievement of one of the finest American writers at work today. 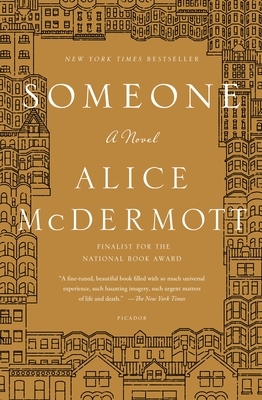 Alice McDermott is the author of several novels, including After This; Child of My Heart; Charming Billy, winner of the 1998 National Book Award; and At Weddings and Wakes, all published by FSG. That Night, At Weddings and Wakes, and After This were all finalists for the Pulitzer Prize. McDermott lives with her family outside Washington, D.C.